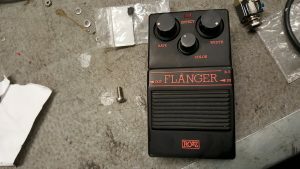 So I got an old Rozz R-5 Flanger on the workbench. It is in a no working condition. The outputjack was missing, the circuitboard is missing at least one diode and a transistor and some of the offboard wiring is loose. Seems like someone has tried to fix it but given up. 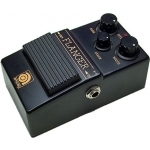 Did some search on the net but could not find a schematic for it but it seems identical to the Ampeg A-5 Flanger . 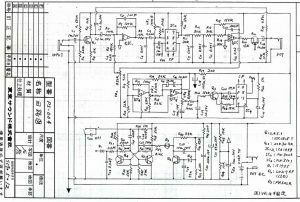 Searching on a schematic for the Ampeg Flanger did get me a schematic that seems correct. 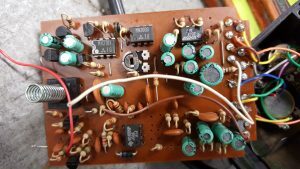 The missing transistor was a 2SK30 for muting the Flanger effect, missing diode was connected to the gate of that transistor.So I got the offboard wiring reconnected and a replaced the missing components and fired it up. It just pass unmodulated signal. Measured the clock IC MN3101 with oscilloscope and found it did not send any clock frequency. Replaced it just to find that the BBD chip, a MN3006 was also broken. Replaced the BBD circuit and yes! There’s a flanging effect. 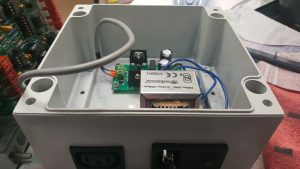 So it was time to get the power supply mounted in the enclosure for the Steiner Microcon Syntheziser. 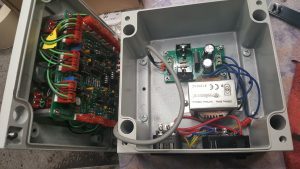 Power inlet, transformer, rectifier and so on. A pretty tight fit but it all went well. 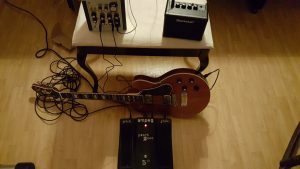 My main concern was that due to the tight fit, I would have transformer hum picked up in the audio path. I must admit it felt god firing it up and realizing there was no interfearence from the powersupply. 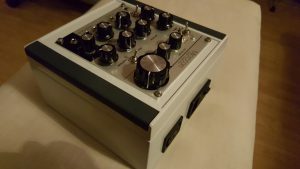 Chassie with transformer and PSU electronics. As seen I mounted a fused powerinlet with built in main switch and a poweroutlet for the Ampeg Patch 2000 pedal.